Et Tu Brewte, a group of students who meet to brew beer, has recently been chartered. The group is led by Ari Klafter ’12. In the Fall, Paul Ahn ’14 will take over for Ari as brewmaster. The Gazette recently talked with Paul, Ari, and Dan Baggarly ’14 to get a sense of what it’s like to get brewing at Swat. Daily Gazette: What is your membership like? What do you do at meetings? Ari Klafter ‘12: It’s kind of varied. I think most of the people who are in the club are people who had some interest in the idea of brewing but first didn’t know exactly what it entails. So they started coming to our meetings and get a sense of that. And they really started to take to the creative process of brewing. As next semester gets going members can start alternating leading the brewing sessions as they gain more knowledge. It would be more of a participatory thing. To brew, we meet in the kitchen in Worth, which has a nice gas stove. All the other dorms on campus have electrical stoves, which don’t work so well. Sometimes, to bottle, we meet in the dorm of whoever’s taking care of the fermenter. During these meetings, we discuss planning and logistical matters. We like to have tastings at the end of brewing and bottling. This is very much contingent on participation because it’s a labor-intensive process. But it sort of makes the group a little more cohesive than if we were just to distribute. It brings the group together to enjoy the fruits of our labors. DG: How does brewing work? AK: We buy ingredients from a local homebrew store in Havertown called Brew Your Own Beer. The owner is a really nice guy whom we’ve sorted of established a relationship with. He sells us the supplies at a discounted price. First you have to steep grains in hot water, basically extracting fermentable sugars. We also use malt extract, which is those sugars already extracted. We boil it for an hour and add hops during that time to give it certain flavor and aroma characteristics. We cool it down, put it in a fermenter, add a yeast strain, and let it ferment. After a week and a half, or two weeks — it depends: you can bottle it, and it’ll carbonate inside the bottle. It’s kind of an involved process, but that’s an overview. There’s an air-lock in the fermenter, which allows the carbon dioxide to produced by the yeast to escape but no oxygen to get in. If the lid pops off, it’s very easy to end up with a spoiled batch. However, nothing that can harm humans can survive in beer. DG: Does the process make Worth smell like beer? Dan Baggerly ‘14: We always have the windows open to disperse the smell. It certainly does not linger for long. But I actually like the smell of beer. Paul Ahn ‘14: Fermentation produces very little odor because fermenters must be air-tight to prevent contamination. While brewing, the kitchen is bound to smell like malt and hops, but I don’t think the odor is any more pungent than if we were cooking food. DG: How did you get into brewing? DB: Making my own beer is a skill I’ve always wanted to learn, and it’s a skill that will last a lifetime. It’s satisfying to consume your own creation. Drinking a nice beer and knowing that you made it makes it all the more worthwhile. PA: Home brewing is accessible. Nothing beats tasting the product of your own hard work. I got interested in beer in particular through my passion for food culture in general. I had never expected to brew before coming to Swarthmore, but I quickly found it to be an engaging and rewarding hobby. AK: I would say I’m a beer geek turned brewer. First, I became interested in craft beer. As I started to navigate that world, I started to understand that there are a lot of people who actually brew as a hobby and that that’s very much doable. I’ve been doing it for about a year now. My parents got me a Mr. Beer kit for Hanukkah. That essentially is the least complicated way that one can possibly make beer—we’ll put it that way. Mr. Beer doesn’t use fresh ingredients—it’s just a powder you mix. Very simple, cut and dry. It doesn’t turn out that well, usually. We’re a few steps beyond that. DG: What do you know about the science behind brewing? AK: I took a brewing science course at UC-Davis over the summer. It was very intensive—there’s so much science that I didn’t even realize was a part of brewing. I just did a lot of reading. I worked at a brewery over the summer as well. I have a pretty good understanding of the science behind it now, but I’m constantly learning. The science is sort of a unique blend of biology, chemistry, and physics. They each apply to different aspects of the brewing process. PA: The fascinating chemical transformation is facilitated by our microscopic friends, yeast. DG: Can you describe your relationship with beer? AK: By immersing ourselves in the process, we focus on the production rather than the consumption of beer. It sheds a new light on what beer should or could be. You gain a greater appreciation and realize that this process has some legitimacy and is an art, a craft, and a science all rolled into one. It’s very much a sensory experience; it’s not about the alcohol. DG: Do you change up the recipes? AK: We’re constantly using different recipes and making different styles. By doing that, it allows us to explore the complexity and diversity of all kinds of different beer styles. As it stands now, we’ve haven’t made the same thing twice. We try to constantly try new things and test our own expectations of beer. There’s always more to learn. PA: The best craft brews are every bit as complex as great wines and in the past few decades people have become increasingly aware of the existence of sophisticated alternatives to commercial beers. DG: What are some of the beers you’ve made? AK: During our last meeting of the year, we brewed a saison. A saison is traditionally brewed in farmhouses in the French-speaking part of Belgium for farmworkers to drink during the harvest season, it’s a dry, easy-drinking style with fruit-like flavors. This fall we’re preparing a batch of a traditional German style of beer for the Oktoberfest, which is celebrated by German Club. DB: I’ve really enjoyed the Weizenboch we made. DG: How does Et Tu Brewte’s beer taste? AL: It generally tastes better than commercial beer. It tastes good—we’ll put it that way. If it didn’t it wouldn’t be such a rewarding hobby. And we haven’t had any failures yet. 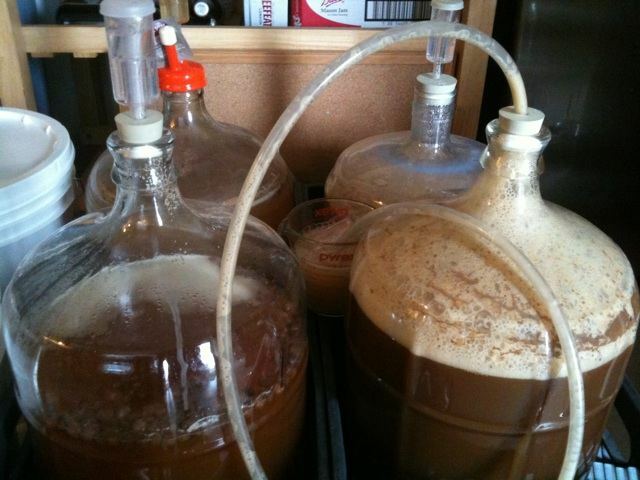 The fact of the matter is…brewing beer is incredibly easy now a days. You can find kits just about any big box store and most don’t even require you to boil it. Here, check out the article below on brewing options. It is only illegal if you sell it, btw. We could always use another brewmaster in this world. Even with the growing popularity of craft beer, craft brewing seems to be saturated with middle aged beer drinkers. It’s refreshing to hear of someone with a younger perspective getting into brewing. Keep it up. i’m confusd.. this is a rly rlly gr8 idea but also isnt this alegal ?? Title 47, Chapter 1, Article I, § 1-102 defines Malt or Brewed Beverages as any beer, lager beer, ale, porter or similar fermented malt beverage containing one-half of one per centum or more of alcohol by volume, by whatever name such beverage may be called. (1) MANUFACTURING WITHOUT LICENSE. Except as provided herein, for any person, to manufacture malt or brewed beverages, unless such person holds a valid manufacturer’s license for such purpose issued by the board. Malt or brewed beverages may be produced by any person without a license if such malt or brewed beverages are produced not for sale and total production does not exceed two hundred gallons per calendar year. Malt or brewed beverages produced in accordance with this paragraph may be used at organized affairs, exhibitions, competitions, contests, tastings or judging provided it is not sold or offered for sale. Since the borough’s dry status just means they don’t grant liquor licenses, I think ETB’s fine on that end at least. Here’s to hoping that drinking age concerns and the fact that the town is dry don’t endanger this group’s future. It definitely makes Worth smell like beer. I live in J-Section, and I can smell it EVERY time they brew. They should probably compensate the residents here with some of their beer.